About Us | TierFive Solutions Group, Inc. Founded in 2005, TierFive Solutions Group, Inc. specializes in providing technology, hardware, software, and services to small and medium sized businesses. We enable companies to protect mission critical data; realize data trends and streamline existing business processes. Our focus is removing single point of failure, business process improvement, enabling document and information sharing by applying the right technology both when and where its needed. Our vast industry experience and expertise enables our clients to realize cost savings and true bottom line benefit. Regardless if our clients needs require an ad-hoc one off software or a synergistic set of solutions, we help them achieve their business goals through our advanced technical and industry knowledge. There’s nothing our versatile team of analysts, management and technical professionals can’t handle. Along with full service discovery, analysis, implementation and integration services, we offer onsite training, dedicated support, and custom programming. TierFive Inc. is dedicated to Integrity, Teamwork, Innovation, Excellence and servicing our clients needs above all else. TierFive delivers both direct solutions and often products that are manufactured or developed exclusively by our technology partners, which makes it easy to proudly stand behind each of our solutions. We represent only best-of-breed leading technology and products (the same mission critical products that we rely on in-house) and as a course of business we will only recommend solutions that are in the best interests of our customers. 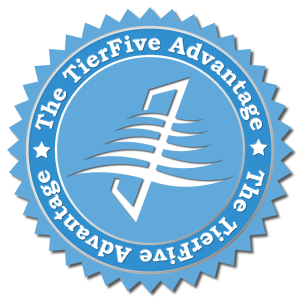 TierFive brings decades of experience in Network Security, Data Center Design, Busisness Continuity, and Enterprise Content Management including Paper and Electronic Forms Automation, Document Management and Fax Automation we integrate these technologies into any business based on the unique needs of it’s niche or situation. Our approach is not tied to a single solution or idea we as work to understand the business problem and then apply a proven technology solution testing every solution to ensure the pieces fit together and integrate into your line of business as designed. Our document management and scanning department specializing in the process of converting hard-copy large-format drawings and small-format documents into electronic files. Our cloud hosted services division that offers managed, hosted, business software solutions including exchange email, lobby management, form delivery, and esignatures. Our custom development and services division that offers development for Web, eCommerce, .NET, SharePoint, and more along with maintenance for Canon scanners.